Evolutionally, the single nucleotide mutation responsible for the sickle haemoglobin gene, (HbS gene) developed from the regions of the world where malaria is holoendemic, leading to the explanation that the mutation is in response to the presence of the malaria parasite. Studies eventually showed that individuals that are heterozygous for the HbS gene are protected from the lethal clinical effects of malaria infection. In other words, malaria confers a survival advantage to carriers of the HbS gene, and this is referred to as balanced polymorphism. On the other hand, malaria infection is associated with significant morbidity and mortality, particularly among children. Unfortunately, lack of success in the effort to eradicate the malaria parasite through the elimination of the Anopheles mosquito or efforts to limit its contact with human being has produced little success, hence the resort to roll back malaria, with the aim of reducing the morbidity and mortality associated with it. Therefore, it is attractive to consider what will happen to the sickle gene if malaria were to be eradicated. That is, the possibility is that the sickle gene may also follow suit since its evolution in the first instance was as a response to malaria., This is the hypothesis being propounded by this article. In that case, rather than shy away from the malaria eradication initiative, it should remain the goal of all malaria programs. 2. Akande TM, Musa IO: Epidemiology of Malaria in Africa. Afr J Clin Exp Microbiol 2005; 6(2): 107-11. 3.	WHO: Global Health Observatory Data – Malaria. Fact Sheet No. 94, April 2015. 4. Centers for Disease Prevention and Control (CDC). Schema of the life cycle of malaria. 2006. Available at http://www.cdc.gov/malaria/biology/life_cycle.htm. Accessed 9th February 2007. 5. Manning L, Laman M, Davis WA, Davis TME. Clinical features and outcome in children with severe Plasmodium falciparum malaria: A Meta-Analysis. PLoS ONE 2004; 9(2): e86737. doi:10.1371/journal.pone.0086737. 6. Wikipedia: Plasmodium falciparum. https://en.wikipedia.org/w/index.php?title=Plasmodium_falciparum&oldid=673036356. 7. Snow RW. Global malaria eradication and the importance of Plasmodium falciparum epidemiology in Africa. BMC Med 2015; 13:23. doi:10.1186/s12916-014-0254-7. 9. Herrick, JB. Peculiar, elongated, sickle-shaped red blood corpuscles in a case of severe anaemia. Arch Int Med 1910; 6: 517-21. 10. Mason VR. Sickle cell anemia. J Am Med Assoc 1922; 79: 1318-20. 11. Bainbridge R, Higgs DR, Maude GH, Serjeant GR. Clinical presentation of homozygous sickle cell disease. J Paediatr 1985; 106: 881-5. 12. Beet EA. The genetics of the sickle-cell trait in a Bantu tribe. Ann Eugenics 1949; 14: 279-84. 13. Kan YW, Dozy AM. Evolution of the Hemoglobin S and C Genes in World Populations. Science 1980; 209: 388-91. 14. Kan YW, Dozy AM: Polymorphism of DNA sequence adjacent to human β-globin structural gene: Relationship to sickle mutation. Proc Natl Acad Sci 1978; 75: 5631-5. 15. Murayama M. Molecular mechanism of red cell “sickling”. Science 1966; 153: 145-9. 16. Neel JV. The inheritance of sickle cell anemia. Science 1949; 110: 64-6. 17. Ingram VM. A specific chemical difference between the globins of normal human and sickle cell haemoglobin. Nature 1956; 178: 972-4. 18. Attah EB. The pathology of sickle cell disease In: Fleming AF (Ed). Sickle-cell Disease; A Handbook for the General Clinician. Churchill Livingstone. Edinburgh, London, Melbourne and New York,.1982: pp 42-56. 19. Higgs DR, Aldridge BE, Lamb J, Glegg JB, Weatheral DJ, et al The Interaction of Alpha-Thalassemia and Homozygous Sickle-Cell Disease. New Engl J Med 1982; 306: 1441-6. 20. Powars D, Chan LS, Schroeder WA. The Variable Expression of Sickle Cell Disease is genetically determined. Semin Hematol; 1990; 27: 360-76. 21. Powars D, Weidman JA, Odom-Maryon T, Niland JC, Johnson C. Sickle Cell Chronic Lung Disease: Prior Morbidity and the Risk of Pulmonary Failure. Medicine 1988; 67: 66-76. 22. Powars D. Sickle Cell Anemia: βS-Gene-Cluster Haplotype as Prognostic Indicators of Vital Organ Failure. Semin Hematol 1991; 28: 202-8. 23. Powars DR, Weiss JN, Chan LS, Schroeder WA. Is there a threshold Level of Fetal Hemoglobin that ameliorates morbidity in Sickle Cell Anemia? Blood 1984; 63: 921-6. 24. Falusi AG, Olatunji PO. Effect of alpha thalassaemia and haemoglobin F (HbF) level on the clinical severity of sickle cell anaemia. Eur J Haematol 1994; 52: 13-5. 25. Olatunji AA, Olatunji PO. Splenic size determination in Sickle Cell Anaemia: An Ultrasonographic Study. East Afr Med J 2001; 78: 26-9. 26. Olatunji PO, Davies SC, Dore C, Old JM. 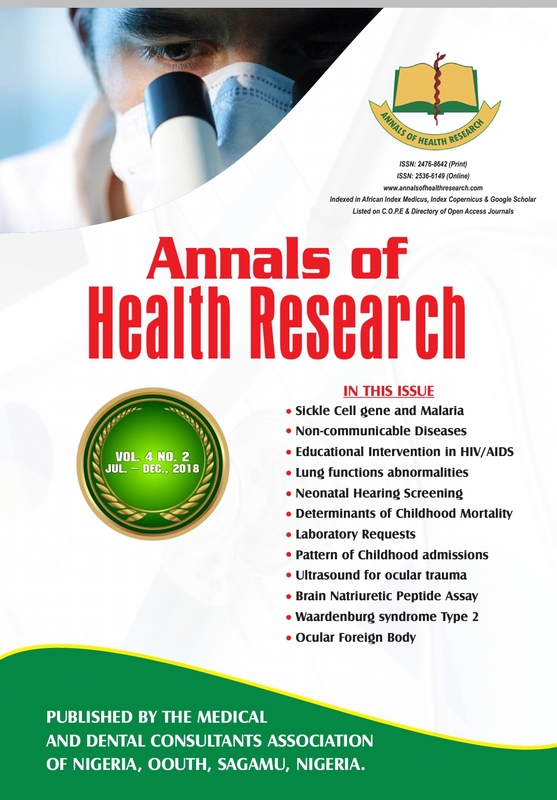 Influence of Gender and Senegal Haplotype on the amelioration of the clinical severity in Sickle Cell Anaemia. Niger Postgrad Med J 2000; 7: 5-9. 27. Haldane JBS. Disease and evolution. Ricerca Sci. 1949; 19(Suppl I): 68–76. 28. Allison AC. Protection afforded by sickle cell trait against subtertian malaria infection. Br Med J 1954; 1: 290-4. 29. Luzzatto L. Genetics of red cells and susceptibility to malaria. Blood 1979; 54: 961–76. 30. Luzzatto L. Sickle Cell Anaemia and Malaria. Mediterr J Hematol Infect Dis 2012; 4(1): e2012065. 31. Ayi K, Turrini F, Piga A, Arese P. Enhanced phagocytosis of ring-parasitized mutant erythrocytes: a common mechanism that may explain protection against falciparum malaria in sickle trait and beta-thalassemia trait. Blood 2004; 104: 3364-71. 32. Ferreira A, Marguti I, Bechmann I, Jeney V, Chora A, Palha NR, et al. Sickle hemoglobin confers tolerance to Plasmodium infection. Cell 2011; 145: 398–409. http://dx.doi.org/10.1016/j.cell.2011.03.049. 33. Instituto Gulbenkian de Ciencia. Mystery solved: How sickle hemoglobin protects against malaria. Science Daily. Available at: www.sciencedaily.com/releases/2011/04/110428123931.htm. Accessed 27th July 2015.